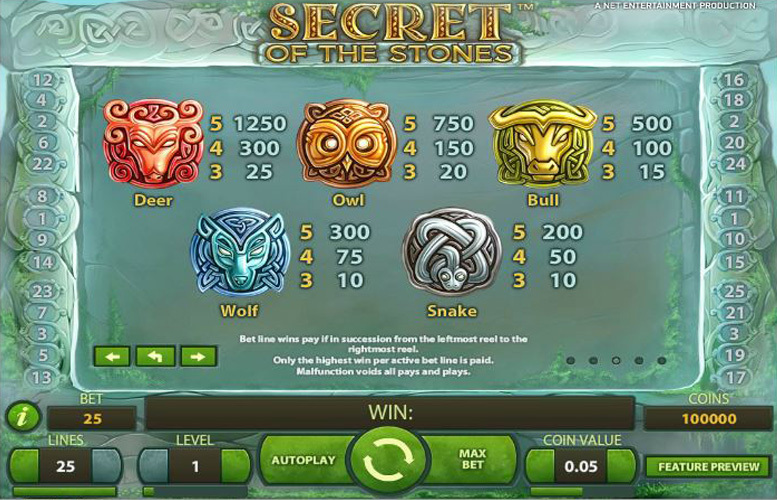 Secret of the Stones is a five reel and three row slot game themed around druids, pagans, runes and ancient stones. Players can choose the number of active paylines from 1-25 and can select one of ten different bet levels and six separate coin values. The game’s theoretical return to player percentage is 96.7% and gameplay includes both free spins and wild substitutions. 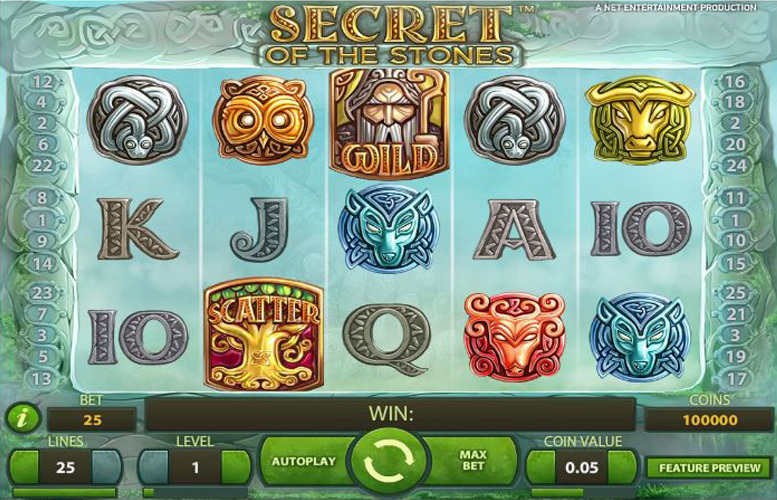 Taking ancient stones and runes as its inspiration, Secret of the Stones is an attractive and interesting five reel slot. To find out if it is the right game for you, you can read on below and find out all about the game’s top jackpot, special symbols, paytable and betting limits. Secret of the Stones can be played with anywhere between one and 25 active paylines but the most valuable combination possible is always that made up of five of the deer stone symbols. That particular combination pays out at a rate of 1250 times the bet level, meaning that at bet level ten it returns a total of 12,500 coins per payline. If a player has all 25 paylines active, therefore, and each and every one of them is taken up by that same combination, a top jackpot of 312,500 coins results (12,500 x 25). The maximum possible coin value that a player can set is 50p and that means that the highest possible jackpot can be worth a total of £156,250. Most of the Secret of the Stones symbols are letters or animal images designed to look like ancient runes but there are also two special symbols. These are the game’s Wild symbol and the Scatter symbol, and these both add extra features to the slot’s gameplay. Wild Symbol – the Wild symbol can appear on any reel during the main game or during free spins and substitutes for all other symbols apart from the Scatter symbol. The substitution which a Wild makes will always be aimed towards creating the most valuable possible winning combination for any payline. Scatter Symbol – if three or more Scatter symbols appear on the reels after a spin, a player will be awarded ten free spins. Those spins will be played at the same bet level and coin value as the spin which triggered them and with the same number of paylines active. At the start of those free spins players must choose either three, four or five stones (depending on how many scatters there were) from a selection of 20, in order to select which bonus features will be active for the free spins. There are four different potential bonus features which can be activated. These are the provision of 2, 3, 4, 5 or 10 additional free spins, an addition of a x1 or x2 multiplier to the spins, placement of a wild reel on reel 2 and/or 4 for the duration of free spins, and the transformation of the deer and/or owl symbol into an additional wild. The most valuable symbols within Secret of the Stones are those runes depicting different animals and the most valuable of all is the deer symbol. Five of those symbols along a payline, return winnings equal to 1250 times the bet level and so can pay out 12,500 coins if the maximum bet level of ten is selected. If all 25 paylines are active, furthermore, and if that combination arises on all of them at once, it results in a top jackpot of 312,500 coins. The second most valuable symbol in the game, meanwhile, is the owl symbol which pays at a rate of 750 times the bet level. If that particular combination appears across 25 active paylines and at bet level ten, therefore, it would result in a jackpot of 187,500 coins. 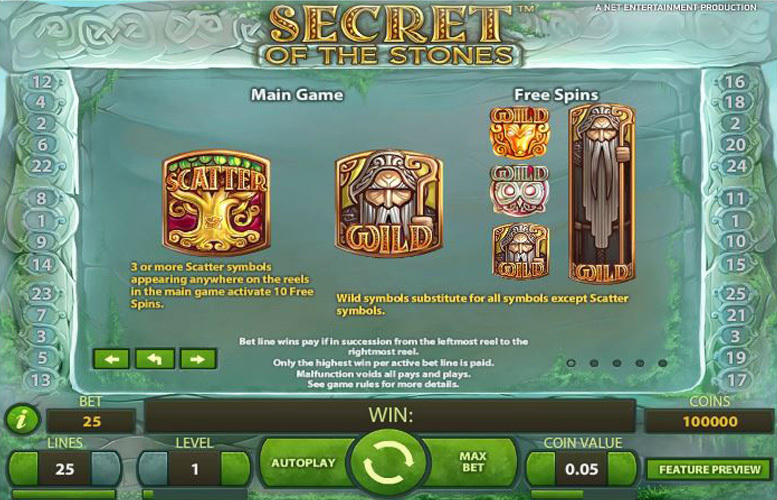 Secret of the Stones players have an almost unmatched level of control over their stake amount per spin, thanks to the fact that they can set the bet level, coin value and the number of active paylines. There are ten bet levels from 1-10, six coin values from 1p to 50p and a full 25 payline options from 1-25. At the lowest end, therefore, players can choose to stake just 1p by selecting one active payline, bet level one and a 1p coin value. At the opposite end of the spectrum, meanwhile, they can wager a maximum of £125 by activating all 25 paylines, choosing bet level ten and setting a coin value of 50p. 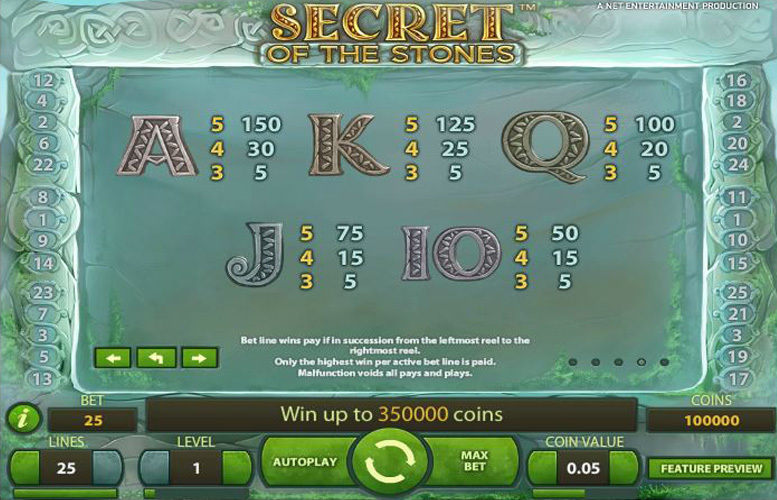 If you’re looking for a simple and straightforward slot game which offers impressively generous top jackpots, then Secret of the Stones could be exactly what you’ve been searching for. The potential highest payout of 312,500 coins, which can be worth £156,250 at the highest coin value setting, compares well with the top jackpots of most other slot games and it is easy to understand how this can be won. The theme of the game, too, is interesting and attractive but the relative lack of extra features and bonuses may put some players off. There are, after all, only simple wild substitutions and free spins offered as addition elements of gameplay. A final area where is slot really excels, however, is in the level of control it gives to players over their betting amount. With paylines, bet level and coin value all adjustable, players can select a huge number of different stake alternatives between 1p and £125. This game has a rating of 4 / 5 with 207 total reviews by the users.